The New York Times bestselling author and one of the greatest adventure writers of our time returns with a pulse-pounding tale of danger, courage, and suspense. Tom Courtney and his brother Dorian battled both vicious enemies and nature itself on the high seas, finally reaching the Cape of Good Hope to start life afresh. Now, half a generation later, they are successful and contented: merchants and family men, prospering on the very edge of an immense and beautiful continent, Africa. In the tradition of Wilbur Smith's earlier bestseller, Monsoon, this spellbinding new novel introduces the next generation of Courtneys. They are out to stake their claim in Southern Africa, traveling along the infamous "Robbers' Road." It is a journey both exciting and hazardous---one that takes them through the untouched wilderness of a beautiful land filled with warring tribes and wild animals. But the most dangerous predators of all are other Europeans, crazed by greed, jealousy, and lust, and determined to destroy utterly all members of the Courtney clan. This quest for vengeance results in a desperate chase---both on land and sea---that is one of the most extraordinary in modern literature. 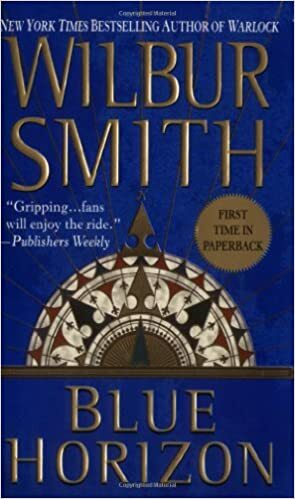 Blue Horizon is a truly great adventure story, told by a master novelist at the height of his powers.